We like a little bit of retail madness here at Babyology so if you have a spare $75,000 and a fairy fanatic in your house, keep reading. Debbie and Mike Schramer are both artists and nature lovers. They created the Fairy Treehouse many years ago from all sorts of things found during their mountain and beachside rambles – driftwood, branches, roots, vines, twigs, leaves, moss, flowers, stones, shells, seaweed, leaf skeletons, wild grasses, seed pods and more have become fairy sized chairs, beds, tables, dishes, books, sculptures, paintings, brooms, clothing and even the kitchen sink. 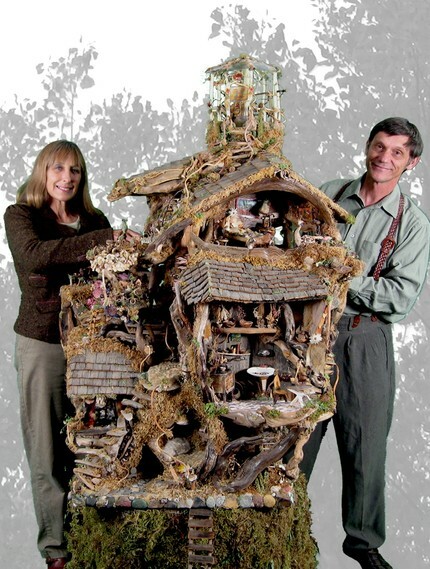 The Fairy Treehouse took six months to build with the Schramers putting in twelve hour days to finish it. The detail is incredible – from the observatory at the very top complete with telescopes, to a sculpturing table and clay, pots to plant flowers and even a tiny ironing board and iron. Stairways and ladders lead to secret rooms, balconies and sleeping hollows – there are little surprises around every corner. The Fairy Treehouse is US$75,000. If you’re not sure your fairies would feel comfortable in such extravagant surrounds, the Schramers also have a Fairy Castle available for US$15,000. Also made from nature’s found treasures, the Fairy Castle is a little smaller than the Treehouse but equally as magical.